Table of Contents Next: Hart, Thomas C.
Dimensions 535' by 72' by 30'6"
1943: 5"/50 gun replaced with 2x2 40mm Bofors AA guns, 10 20mm Oerlikon AA guns. Squadron flagship facilities added to Harris and Zeilin. By 1945, light antiaircraft had been increased to 1x4, 2x2 40mm guns and 20 20mm guns. 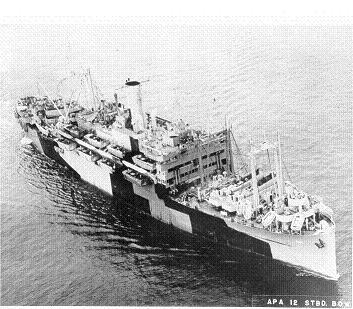 The Harrises were large passenger liners taken over by the U.S. Navy for conversion to troop transports. They were relatively fast and spacious ships and performed well in their new role. Each carried 4 LCM, 18 LCVP, 2 LCPL, and 1 LCPR to bring the troops ashore, and had six 30-ton, six 10-ton, and two 7.5-ton booms.